Since I was little, I have always wanted to raise chickens. There is just something so rustic and appealing about gathering your own eggs, don’t you think? I recently began thinking of buying a few chickens and getting started on my own brood, so I thought about where I would keep them. We live in the country so you have to be sure to protect chickens and other fowl from coyotes, foxes and other animals that would love nothing more than to feast on your small farm animals. So, I started looking for chicken coops. 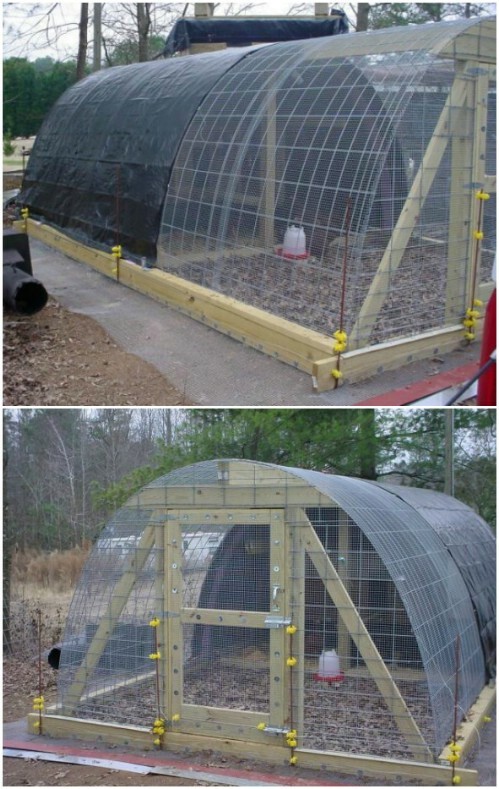 Of course, I want something that I can DIY but I also want it to be relatively cheap to build and I want it to protect my chickens from other animals. 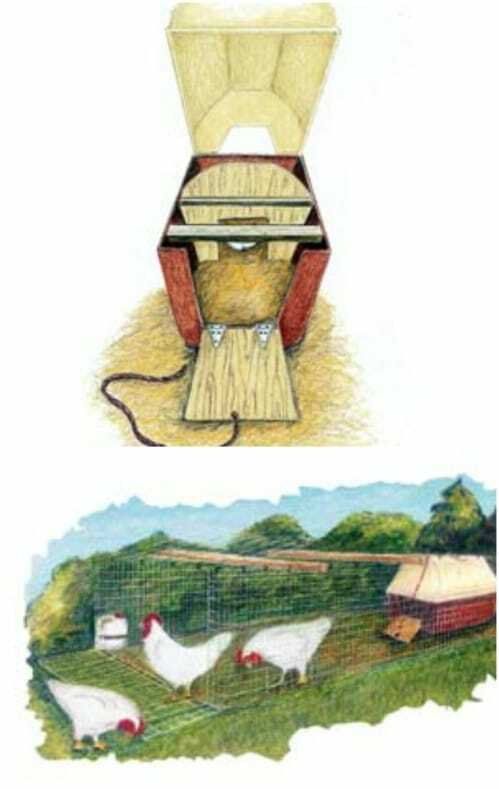 What I found are 20 of the most adorable chicken coops with free building plans that you can DIY in a weekend. You seriously need these in your backyard. They are all so easy to build and many of them hold several chickens, so you have room to really get started with your chicken raising. I love projects that add function and décor to my backyard. Take this DIY brick barbecue for instance. It’s easy to build and so functional. 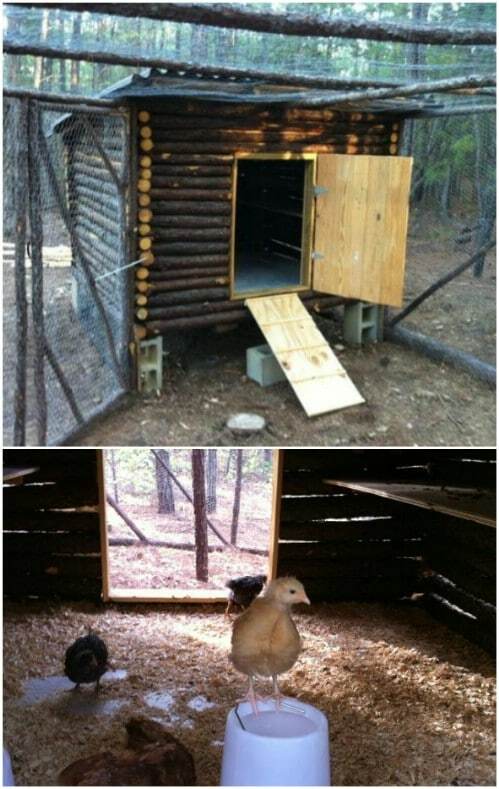 That is exactly what I want in a DIY chicken coop. It should be functional but also really easy for me to build by myself and if I can do it with upcycled materials, well that’s even better. 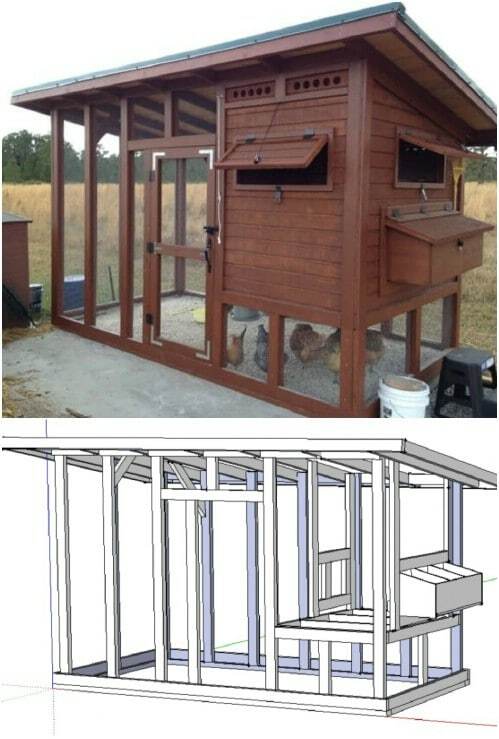 So, I gathered up 20 of my favorite free chicken coop plans to share with you. Some of these can be build for less than $50 and all of them are easy. Plus, they offer such style and décor for your backyard. If you have always wanted to raise your own chickens, now is your chance. Build one of these free DIY chicken coops this weekend and take a look at these 80 backyard furniture ideas that will also add style and function to your backyard. 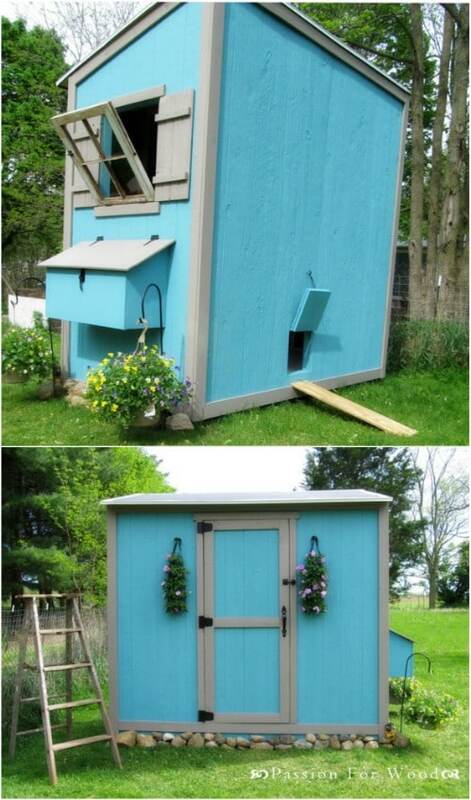 This chicken coop looks like an old fashioned gardening shed and it will add lovely décor to your backyard. This one is really easy and doesn’t require you to know a lot about construction. You can make this with boards that you have left over from other projects and even if you have to buy all of the materials, it won’t cost much. Plus, it’s a quick build. You can definitely put this one up in a weekend. 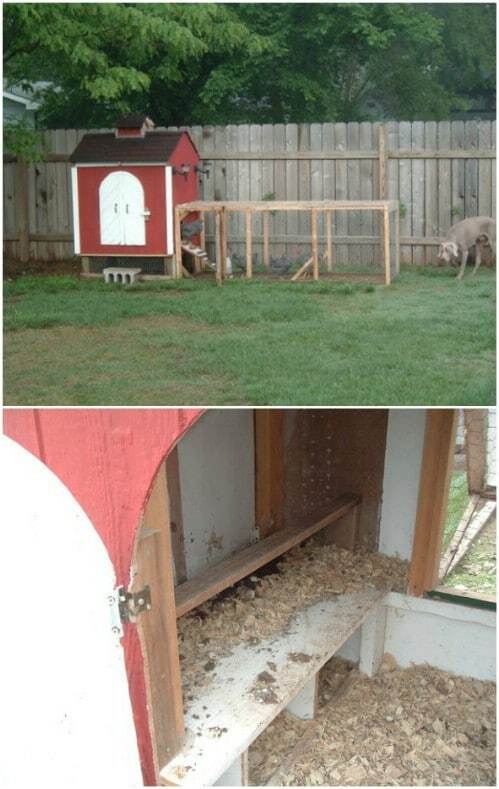 This DIY chicken coop is really roomy so you have plenty of space for all of the chickens that you want to raise. You also build the roosting nests and there is room for several of those. If you are serious about collecting your own eggs – and even selling them – then this is definitely the chicken coop that you want to check out. You don’t have to spend a fortune at the hardware or home improvement store to gather materials to build your own chicken coop. This upcycled chicken coop is made from many repurposed materials like old cabinet doors. You could even use old cabinets or pallets to build it in. You’d be amazed at the number of DIY cabinet door projects that you can find. If you plan to treat your chickens like royalty, then they are definitely going to need you to build this chicken palace. 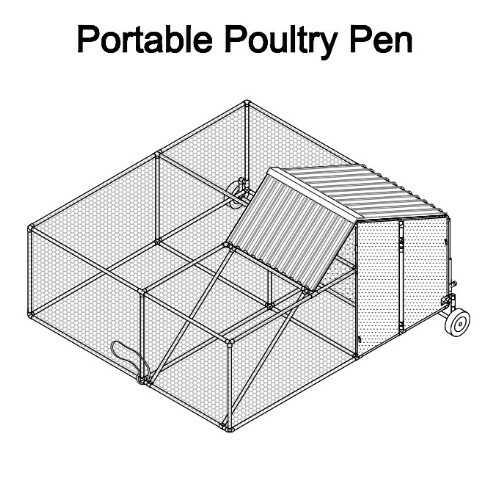 This one has enough room for six hens or you could adjust the plans and make it bigger if needed. This is a really nice looking chicken coop that is sure to add some aesthetic pleasure to the backyard and as fancy as it looks, it is not at all difficult to build. This two story coop has so much room and it is built from a recycled two story play structure. 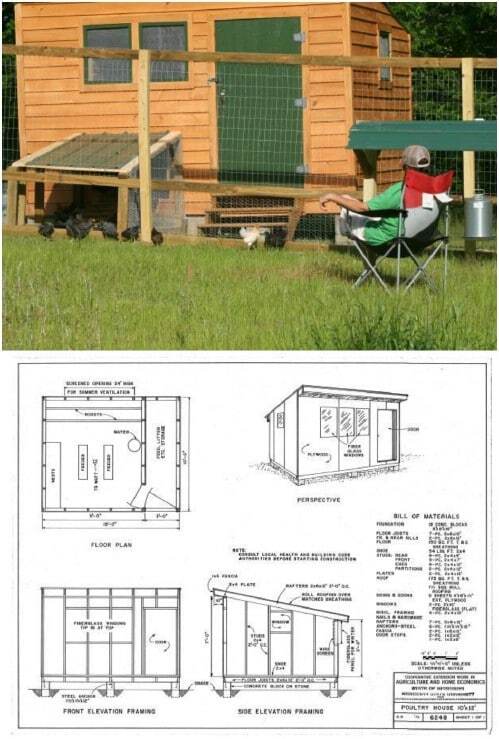 If you have one that you can use, that is a good base for building this chicken coop. You can check online and at thrift stores to see what they have on hand, too. The point is that this one is made from upcycled materials so there is no need to visit your hardware store for lumber. That makes it cheaper and since you’re recycling, it’s also a green coop. If you want something rustic for the backyard, this log cabin chicken coop is it. Now, if you have to buy the logs, this one will set you back a couple hundred dollars. If you have the logs, you won’t spend anywhere near that much to build it. Either way, you have to admit that it is a beautiful structure and your chickens are going to love living in their very own log cabin. I love the coloring of this easy to build chicken coop. The red and white give it a great rustic barn look and it is a super easy one to build. If you only need room for a handful of chickens, this is a great plan to follow. The cost will depend on what materials you have on hand but even if you have to buy them all, this one is pretty cheap to DIY. If you are watching a budget but still want to provide housing for your hens, this $50 chicken coop is perfect. It’s a lovely house, too and has room for a handful of hens. You get about four square feet per hen, which is plenty of room and this one is off the ground so there are no worries of other animals bothering your brood. If you want a cheap yet functional chicken coop, this is definitely the one for you. This mini portable chicken coop is really easy to build. You start with an igloo shaped doghouse and build the coop out from there. 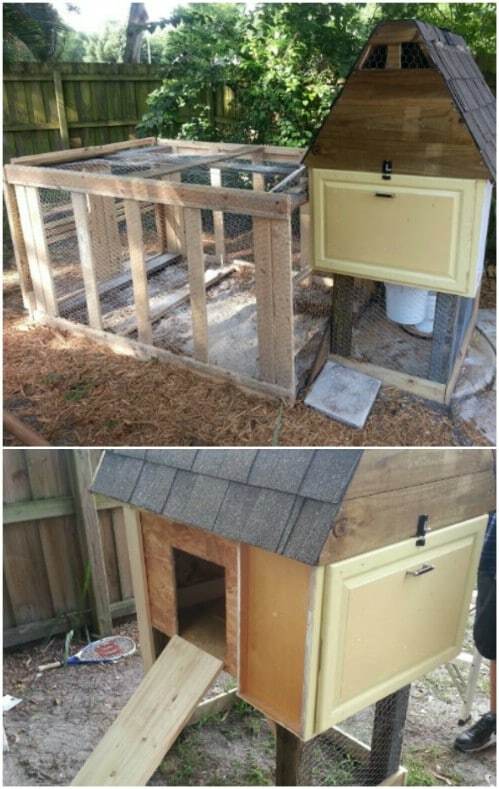 It’s the perfect size for three or four hens and costs less than $100 to build – if you have to buy all of the materials. It’s also a great coop for letting your chickens have their fair share of insects and other natural foods. This little chicken coop has such a great farmhouse quality to it. It looks like an old barn, but in miniature form. It’s a really easy one to build, too despite the architectural flair and it will look great in your backyard, especially if you want something to go along with those DIY farmhouse decorations. It also has an easy to access nesting box so gathering eggs is simple and quick. 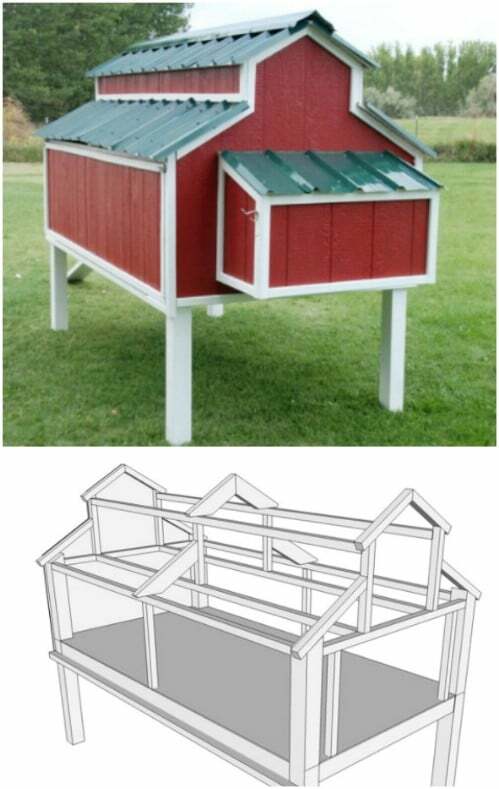 This little chicken coop can be built wherever you need it – even on the side of a building if needed. It’s perfect for a small handful of hens and you can build it from materials that you have left over from other projects. You don’t even need that much lumber or hardware to make this one and since it’s small, it’s pretty easy to move if you need to relocate it in the future. If you have several hens and you need room for all of them to roost, this chicken coop is perfect. The plans are really straightforward and easy to follow and you can paint this one and make it look like a mini house. 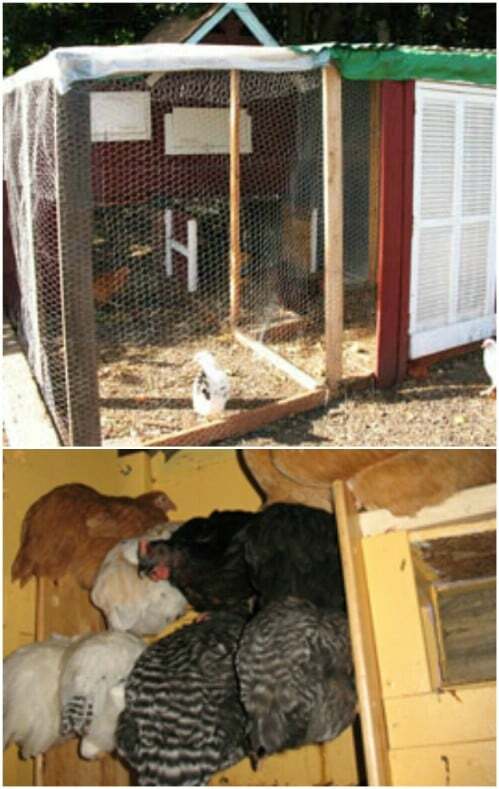 Chickens will love the space and you will love how it keeps them safe from other animals. You use PVC pipe to build this portable chicken coop that can be moved whenever needed. There are wheels on the backside of this one so you can just pick it up and relocate it whenever you want. 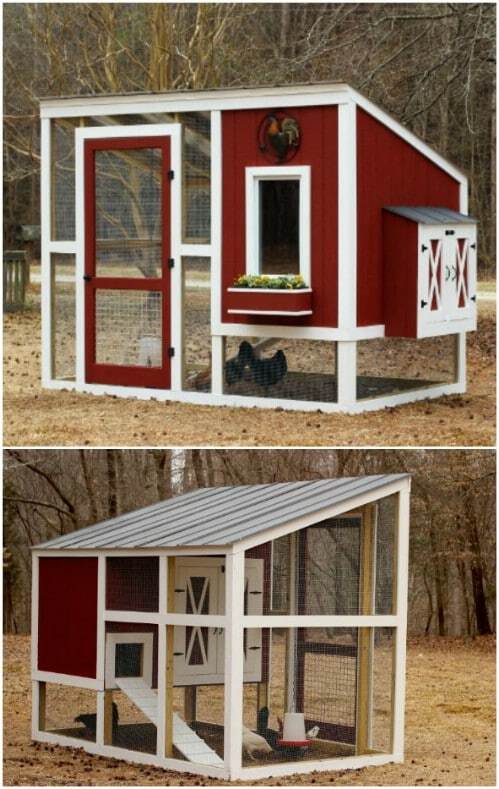 It gives your chickens plenty of outdoor space to roam and has a nice roosting area, as well. This one is pretty easy and the structure can be made from repurposed PVC pipe. If you only want to keep four or five chickens, this little coop is perfect. It is really easy to build and you’ll only spend about $40 on the materials if you have to buy them all. I love the barnlike look of this one but you can do it in any color or scheme that you want. Your costs for this quick and simple chicken coop include chicken wire, 2X4s and some siding – check with wholesalers or contractors for cheap damaged siding. 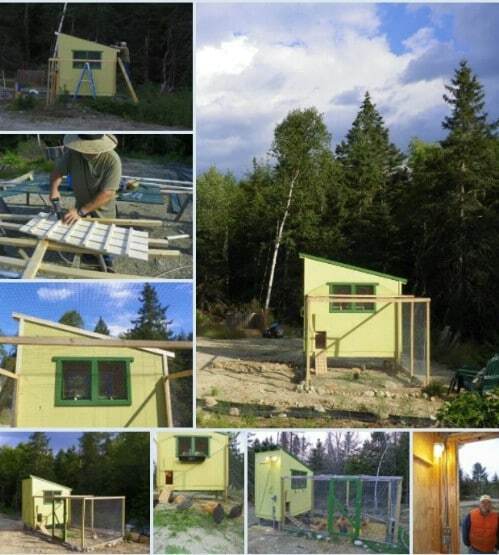 You can build this chicken coop completely out of scrap lumber. If you have the scrap lumber, this one is completely free to build, aside from the fencing that is. This is one of the least expensive and easiest chicken coops that you can add to your backyard and you can definitely have it built in a weekend – and have time leftover for other DIY projects, too. 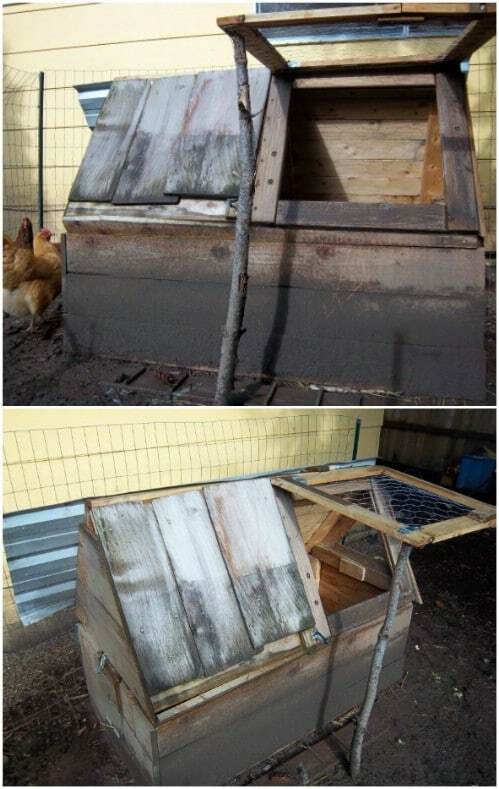 This DIY chicken coop has shingles that are made from recycled aluminum cans. 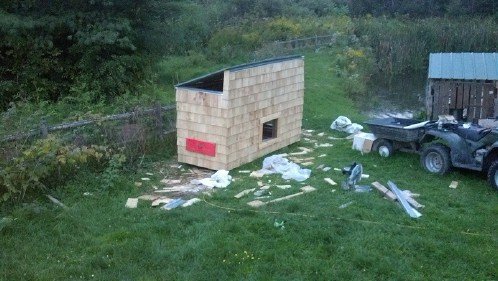 The coop itself is really easy to build and how cute are those shingles? You can build the entire thing in just 10 hours and it only costs around $40. If you have soda or beer cans on hand, you already have your shingles. If not, check with friends and family and have them save their cans for you. There are so many wonderful ways to recycle aluminum cans. 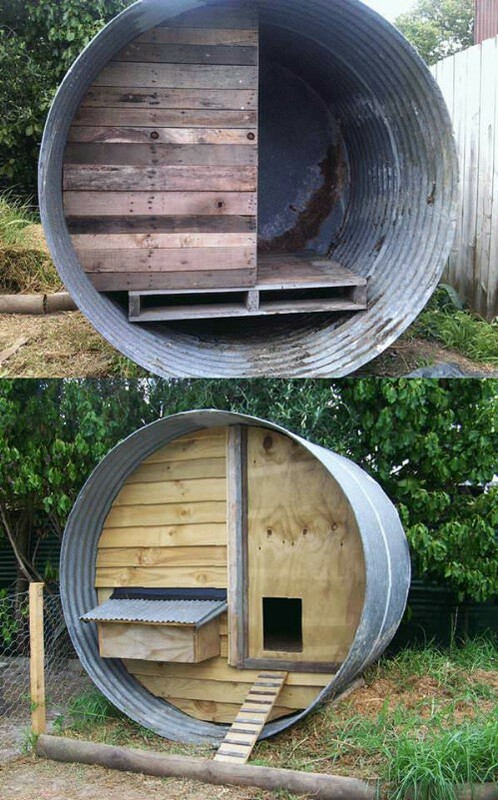 You can turn an old water tank and a few pallets into a great little chicken house. The house itself is already built on this one so you save time. You just have to add the extras, like the nesting box and entry for the hens to get into the house. It’s a genius idea and one that will save you both time and money, if you have access to an old water tank, that is. An old trampoline can be turned into a very roomy chicken coop, and this one saves you money if you have a trampoline that you are no longer using. You can often find these online for really cheap, too from people who just don’t use them any longer. You just have to build the nesting box and set up the wire to keep your hens inside. Those old pallets that you have lying around waiting on a DIY project will come in really handy when it comes to building your chicken coop. 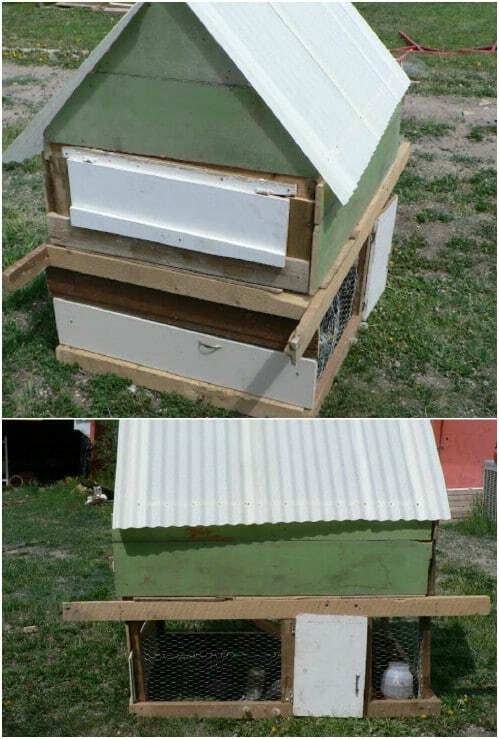 This is one of the easiest coops that you could build and it’s really cheap, particularly if you have a stack of pallets that you can use. The pallets make it so easy to put together. Your walls are already built – you just have to frame them in and add your nesting box.